Automated office blood pressure (AOBP) has been recently shown to predict equally well to ambulatory blood pressure (ABP), conventional office blood pressure (OBP) and home blood pressure (HBP), cardiovascular (CV) events among hypertensives. 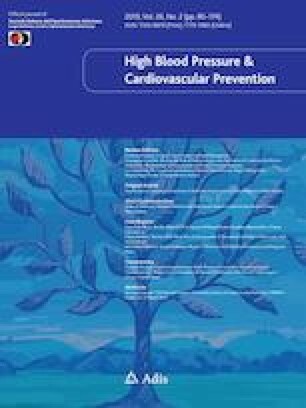 To compare AOBP recording and ABP monitoring in order to evaluate morning blood pressure (BP) peak in predicting CV events and deaths in hypertensives. We assessed 236 initially untreated hypertensives, examined between 2009 and 2013. The end points were CV and non-CV death and any CV event including myocardial infarction, evidence of coronary heart disease, heart failure hospitalization, severe arrhythmia, stroke, and symptomatic peripheral artery disease. We fitted proportional hazards models using the different modalities as predictors and evaluated their predictive performance using two metrics: the Akaike’s Information Criterion, and Harrell’s C-index. After a mean follow-up of 7 years, 23 subjects (39% women) had at least one CV event. In Cox regression models, systolic conventional OBP, AOBP and peak morning BP were predictive of CV events (p < 0.05). The Akaike Information Criterion showed smaller values for AOBP than peak morning BP, indicating a better performance in predicting CV events (227.2736 and 238.7413, respectively). The C-index was 0.6563 for systolic AOBP and 0.6243 for peak morning BP indicating a better predicting ability for AOBP. In initially untreated hypertensives, AOBP appears to be at least equally reliable to 24-h monitoring in the evaluation of morning BP peak in order to detect CV disease whereas the sleep-trough and preawakening morning BP surge did not indicate such an effect. The online version of this article ( https://doi.org/10.1007/s40292-019-00315-7) contains supplementary material, which is available to authorized users. The authors thank our clinic’s nurse, Mrs Ioulia Bali, for her contribution in recording the AOBP and OBP values of the studied population. We received no funding for this work. All procedures performed in study participants were in accordance with the ethical standards of the institutional research committee.